Located in rural southern Michigan, the nearly 400-acre Hillsdale campus includes both modern and historic buildings. 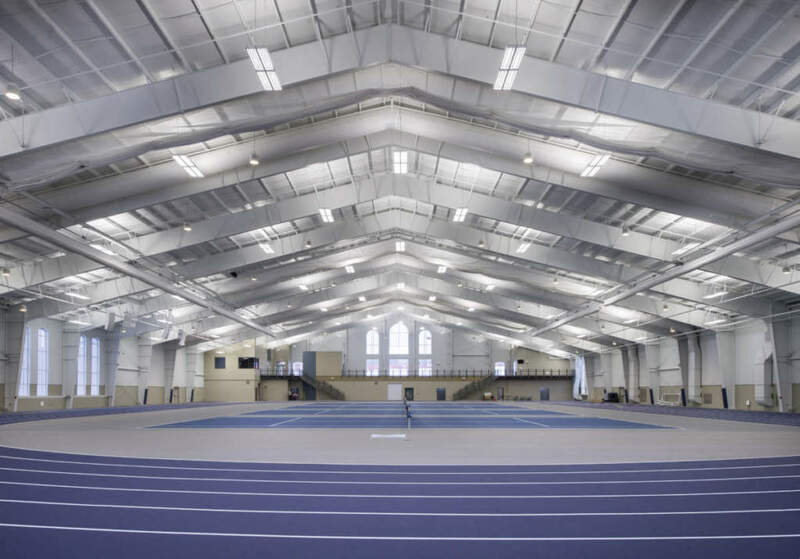 To improve their athletic facilities, Hillsdale College looked to Weigand Construction to build a multi-purpose facility that could accommodate large events. The Margot V. Biermann Athletic Center provides space for large campus and community gatherings, concerts, convocations, in addition to its characteristic use for physical activities. Coaches’ offices, an athletic training room and hundreds of square feet of storage area are also included in the 70,000sf facility. A six-lane oval/nine-lane straightaway indoor track, which meets all standards currently in place to host an NCAA championship-level event, surrounds the facility, with four tennis courts covering the interior.